Wine & Paint Night to Benefit SFC! Monday, May 14 from 6:30-8:30 p.m.
Unlock your creativity and support a great cause! 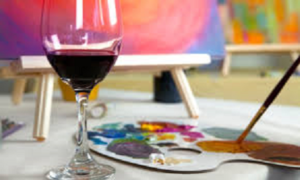 Enjoy a glass of your favorite vino while learning how to re-create a featured painting. Paint, canvas and brushes, in addition to appetizers and wine, will be provided while an experienced painter leads you step by step through the process of unleashing your inner artist. RSVP today to Marianne Kulikov, St. Francis Center Development Director, at marianne@sfcla.org or call 213.747.5347. Tickets may be purchased online here! Feeding, serving, and walking with the poor as a community of hope in downtown Los Angeles for over 45 years. Wrapping Up the Holiday Season at SFC!